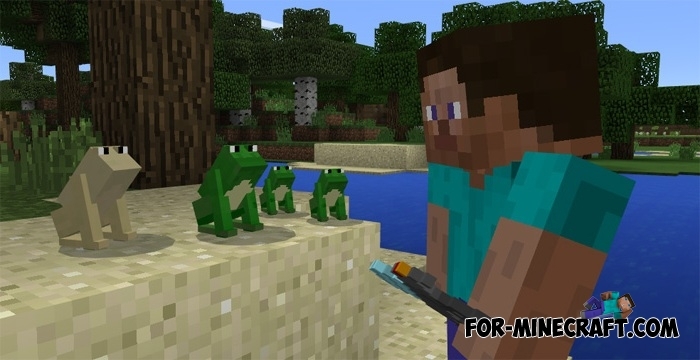 You do not even suspect that frogs can become your friends in Minecraft PE 1.1. These cute green creatures are so small that it will be difficult for you to notice them in the grass. They live in forests or steppes and feed on flies. In fact, there are many colors of frogs and you can choose a pet to your liking. In nature, frogs are very weak, so after you have tamed this creature, you need to protect it and better build a small aviary for it. How to find and tame frogs? If your house is near a forest, then you are lucky. Go to the trees and you will surely find some wild frogs. Tame them with flies and put a leash so that your pet is not lost. Tamed frog can perform some commands, and also eat flies with pleasure. Perhaps this is the most harmless pet of all that were created for Minecraft Pocket Edition. We have added lions, tigers, bears and even elephants, but frogs will surprise you. Dinosaur Pack for Minecraft PE 1.0.5 / 0.17.0The pack includes different add-ons for Minecraft PE 0.17.0 / 1.0.X. Here you will find unique dinosaurs..